Do you want to know about Order Aadhaar reprint? Order Aadhar card reprint service is launched by UIDAI to order Aadhar card by post which is delivered directly to your registered Address within five working days. In this tutorial, you will know how to get an original copy of Aadhaar card by Order Aadhaar Reprint (Pilot Basis) easily. It’s straightforward and easy to get Aadhaar through this UIDAI service at home. What is Order Aadhaar Reprint Service? How many days will it take to receive Aadhaar? “Order Aadhaar Reprint” is a new Pilot Basis service launched by UIDAI which allows the residents of India to get their Aadhaar card reprint delivered home by paying nominal charges. In case if your Aadhaar card has been misplaced and now you want to print PVC Aadhaar card online. You can apply for original Aadhaar again through this service. If you do not have registered mobile number, you can still order Aadhar card reprint using Non-Registered or Alternate Mobile Number option. But if you urgently need Aadhar card, you can download e-Aadhar online via UIDAI website or through the mAadhaar application. To use Order Aadhaar Reprint pilot basis service you have to pay Rs.50/- (inclusive of GST & speed post charges). Step by step guide for How to Order Aadhaar Reprint Pilot Basis service. Non-Registered /Alternate Mobile Number, where OTP will be received on Non-Register/ Alternate Mobile number. Registered Mobile Number, where OTP/TOTP will be received on Registered Mobile number. 1. 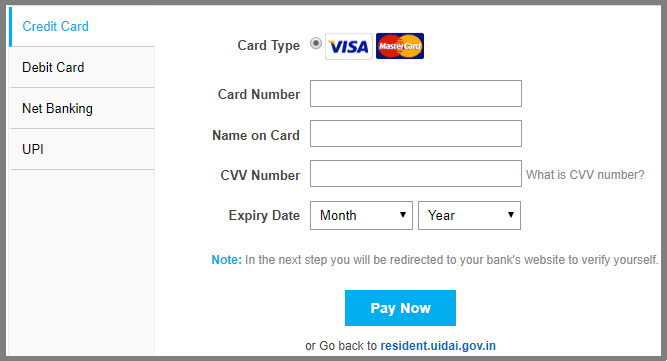 Visit the UIDAI official website. 2. Click on “Order Aadhaar Reprint (Pilot Basis)” Service. 5. Please enter Non-Registered / Alternate Mobile Number. 6. 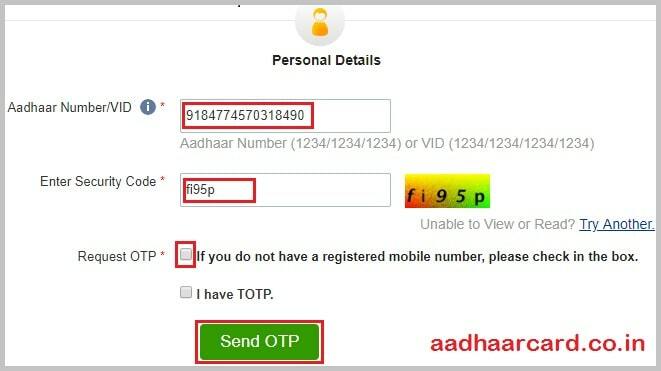 Click on “Send OTP”, an OTP will be sent on your register mobile number. 8. 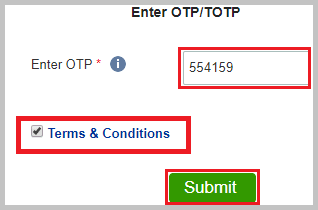 Click on “Submit” Button to complete OTP verification. NOTE: Preview of the Aadhaar details will not appear for a Non-Register mobile number. 9. Click on “Make a payment”, You will be re-directed to Payment Gateway page with payment options as Credit/Debit Card, Net banking and UPI. After successful payment, a receipt will get generated having a digital signature which can be downloaded by the resident in PDF format. You will also get the Service Request Number(SRN) through SMS. Resident can track the status of SRN till dispatch of Aadhaar Letter on Check Aadhaar Reprint Request Status. Resident can further track delivery status by visiting the India Speed post website. 2. Click on “Order Aadhaar Reprint(Pilot Basis)” Service under Get Aadhaar Section. 5. If you have TOTP, choose the option “I have TOTP” by clicking in the checkbox, Otherwise, click on “SEND OTP” button. 6. Enter OTP/TOTP received on registered mobile number. 8. 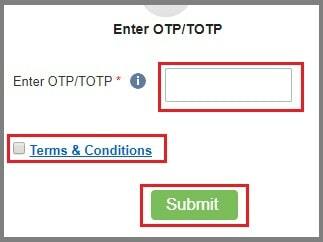 Click on “Submit” Button to complete OTP/TOTP verification. NOTE: Preview of the Aadhaar details will appear for verification by the resident before placing the order for reprint. 9. Click on “Make a payment.” You will be re-directed to Payment Gateway page with payment options as Credit/Debit Card, Net banking and UPI. After receiving an order for ”Order Aadhaar Reprint” from the resident, UIDAI will handover printed Aadhaar Letter to DoP (Department of Post) within five working days (excluding the date of request). Aadhaar Letter will be delivered using SPEED POST Service of Department of Post (DoP) in line with DoP delivery norms, and Delivery Status may be tracked using DoP Status Track Services. If you do not want to wait for five days you can go with Retrieve lost Aadhar to get a duplicate copy of your Aadhar card instantly. You can track the status of your order Aadhaar reprinted request till the dispatch of the Aadhaar card. 2: Enter the 28 digit SRN code as received by you in your acknowledgment receipt or on your mobile. 3: Then Enter the 12 digit Aadhaar number (UID). 4: After that fill the security code and click on submit. Make sure the details mentioned by you are correct. Then the status will be displayed on your screen. ANS. 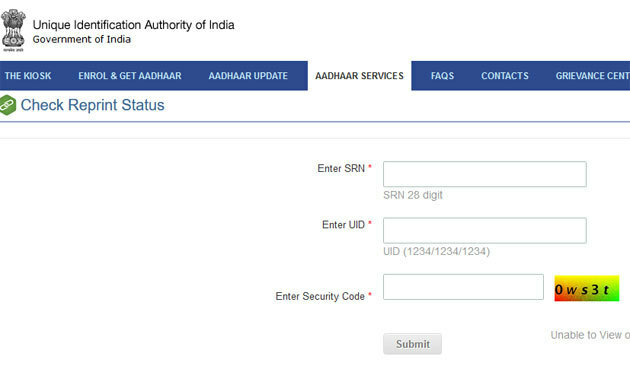 SRN is 28 digits Service Request Number which is generated after raising a request for Order Aadhaar Reprint on UIDAI and is used to check Aadhaar status in uidai gov check your aadhaar status portal. Q. What is the AWB number? ANS. Airway Bill Number is the tracking number that is generated by DoP, i.e., India Speed Post for the assignment/product that they deliver. Q. Do we have the option to raise an Order Aadhaar Reprint request on the different address? ANS. No, for that you have to update your Aadhaar details by visiting nearest Enrollment center or Online update through aadhar self-service update portal.